Paul Begley is 46, Irish and until recently, had a good job. He travelled around the world, packing fruit and vegetables into big crates. Then he shipped them to Ireland and sold them to supermarkets. If you wanted a good gherkin or an organic asparagus, he was your man. It wasn’t glamorous work but it paid the bills easily and allowed him to take on a few people. He donated money to children’s charities and liked getting involved in awareness campaigns like “Kids in Action.” Now he’s going to prison, because he pretended that his bulbs of garlic were apples. He’s going to stay there for six years, just in case anybody else gets the idea to mislabel their garlic. The tone might be facetious but the facts stand: As Judge Nolan said as he was sentencing him, Paul Begley was a “decent man.” He was probably about as honest as the next person. It’ll cost the Irish taxpayer around half a million euro to keep him in prison. For every bit of money you earn, a little portion of it will go towards keeping Paul Begley in his cell. If, as is likely, he gets depressed you might also end up contributing to the salary of a prison psychologist. As he said himself, what Paul Begley did was wrong. He shouldn’t have put “apple” labels on boxes of garlic. He shouldn’t have avoided paying tax, because no matter how inordinately high the tax on garlic, as opposed to say its cousin, the onion, Paul Begley was not in a position to take the law into his own hands. He admitted it. He helped the police with their inquiry. He agreed a mode of repayment. And still, he was sentenced to six years in prison. The harsh sentence made headlines around the world. Prison is for people who are a threat to society when free. It is a practical, rather than moral solution to society’s problems. In reality it is neither about revenge nor rehabilitation. It is a preventative strategy, and nothing more. The chances of Paul Begley reoffending are very slim. For one, he’s bankrupt. He has €1.6 million to pay back, probably with hefty interest. He’s been humiliated. There’s not a supplier in Ireland that doesn’t know his name. At 46, he’ll probably call it a day and retire to a modest orchard somewhere, where he will consider his crime, live a quiet life and try to make ends meet. He is not a danger to society. The following scenario is analogous to Paul Begley’s crime. Think about it and ask yourself on a scale of 1-10 how serious the offense. Imagine you’re in your local supermarket doing the weekly shopping. You pick up a few loose onions and pop them into a bag. 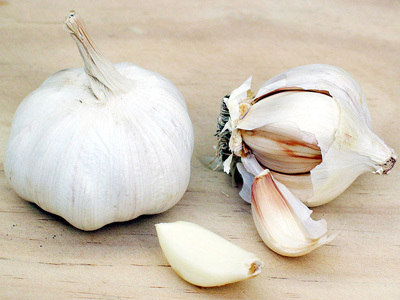 Then you grab a couple of garlic bulbs and put them in another. You plop the bag with the onions onto a weighing scales and press the picture with the onions on it. You collect the little label with the price and stick it to the bag. Then you do the same with the garlic, except this time, the price is 25 times as high. This time, you press the picture of the onion. You pick up the sticker, which shows an amount 25 times less than the previous one and attach it to the bag. Sure onions are just obese garlics, you think as you make your way to the till, where the sales assistant scans the two bags through without a second glance. Paul Begley has already lost his reputation. Putting him behind bars means that the tax payer loses out too. As for the argument that the purpose of the ruling is to deter others from committing the same crime, perhaps we should consider first of all, why the authorities find it so difficult to keep track of customs fraud, and second, why the tax on Chinese garlic is up to 232 % while that on onions is 9%. This entry was posted in Columns and tagged 6 years in jail, Begley brothers, Ireland, Judge Nolan, Kate Ferguson, Katekatharina, Life, Paul Beggley garlic scam, Society by Kate Katharina. Bookmark the permalink. An onion as an obese garlic or a garlic as a slimmed down onion – maybe this would have had a better chance of non-detection. 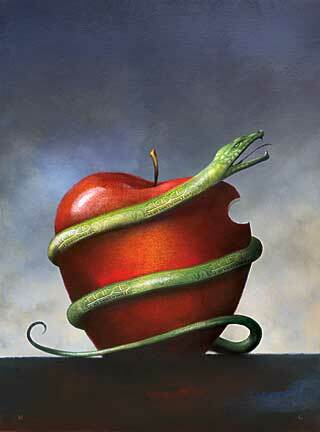 The apple has unfortunately lived up to its name as the forbidden fruit – encircled by a serpent. What is justice and whose needs are served? As ever a very insightful piece of work! Thank you, Bewunderer! The apple does always does seem to contain poison.. I have to say I feel sorry for the man and his family. But if he sold the garlic at onion prices he is a hero, but I bet he sold the apple-garlic at garlic-market prices which compensate for the tax making more profit from his lawless ways. I’m a socialist so rich businessman tax evasion stories usually make me choose knee jerk reactions! nice to hear from you! Sorry I’ve been out of touch! When something is totally disproportionate, like the tax on garlic, I can understand, not condone what he did. People hear “businessman” and go “hang him” but I bet many of them aren’t 100% honest themselves. And that to me is the point. I’ve been laughed at for being “way too honest and moralistic” by the very people who think this kind of guy should go down. I have no idea if he’s that rich, he might be. The website of the family business is unimpressive and contains lots of grammatical errors. It kind of made me feel more sorry for the family. I’m strange like that. Berlin is incredible! I thought it would be ugly and dangerous but it is interesting and efficient. I have a nice flatmate but no friends but I’m becoming very good at being alone, which I believe is a life skill. How’s everything with you? I love the header. I need to backread your stuff now. Things have been a bit crazy, working long hours and settling.. But I’m now back in the blogosphere! yeah catchup you rascal! Not really, you only missed some photos of girls on my blog. I thought Berlin was ugly, but had cute bars and cafes. Being alone is a life skill, and a slippery slope both – master it but don’t get too used to it. What is stopping the Germans liking your company? Or is it the other way around? Get a part time job in a bar on saturday nights, it is a good way to socialise without socialising. Or join a synchronised swimming display team! I still hate the garlic business man, death to the rich!! well considering china produces 80% of world garlic and almost eveything we wear the euro union is so right to put a tax and he should have gotten the garlic from france or even here if he has such good taste in food!!!! !and keep it in the eu so we can have jobs rather than china!